Super Eagles captain, John Mikel Obi has said his family would not be happy with him if he fails to qualify Nigeria for the Russia 2018 FIFA World Cup. Mikel, who is married to a Russian woman Olga Diyachenko, revealed that his Russian family, relatives and friends were earnestly rooting for Super Eagles to be at the World Cup next year, adding that he was optimistic that Nigeria can earn a place at the global finals. “My wife is Russian and many of our relatives and friends are from Russia. They are all expecting Nigeria to qualify for the next World Cup. I think they will kill me if I fail them,” he added, laughing. 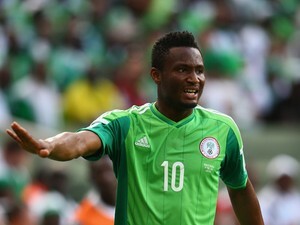 As might be expected given his role as captain, Mikel Obi had figured prominently in Nigeria’s qualifying campaign thus far. Notably, he scored one and set up for another in their most recent triumph: a 3-1 win over Algeria in November. Nigeria is already four points clear of second-placed Cameroon and five ahead of Zambia and Algeria in Group B.